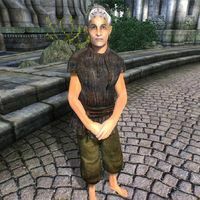 Ragbag Buntara is an Imperial beggar living in the Temple District of the Imperial City. Her bedroll and food sack are located behind Pennus Mallius' House. She follows a slightly different schedule than other beggars, starting her day at 6am and heading to the front of the Temple of the One, where she will spend the next six hours begging for food and money to the townsfolk passing by. At 12pm she will head to the back of the Temple, where she will continue her begging routine until 6pm. At that time she will retire to her bedroll to have a two-hours dinner if she finds any piece of food in her sack. After she has had her only meal in the whole day, she will stroll near the area for two hours more, until her bedtime at 10pm. Her lower-class attire certainly reflects her social status, consisting of only a sack cloth shirt combined with the matching sack cloth pants. She may also be carrying any amount of gold that she managed to earn during the day. As a beggar she can't afford spells or weapons, relying on her bare fists during combat. Buntara is infected with the swamp fever disease, which you may contract should you fight with her. She is one of the few people that can give you some information on how you may join the secret association of the Thieves Guild and will assist you in some of your jobs for the Guild. She is also one of the "poor and suffering" that you need to speak with in order to gain Tandilwe's master training. This page was last modified on 1 January 2014, at 09:30.